Zara black with red & white striped wrap blouse. Size M 12. Immaculate! NEW but without tags due to being laundered for sale after being in storage. Dispatched with Royal Mail 2nd Class. Zara Ladies Striped Cotton Top Size L (12-14). Condition is Used. Dispatched with Royal Mail 2nd Class. Worn once so in excellent condition. Zara Linen & Cotton White and Blue Stripe Top. Ties at waist. Fastens with button at the rear. Size Medium. In good used condition. Please see my other listings. I’m having a massive wardrobe clear out with lots of Jigsaw, high end denim (7 for all mankind) as well as lots of lovely Zara bits! Happy to combine shipping on multiple items - just ask before checking out. 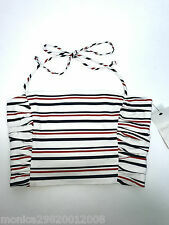 Zara Striped Bow Top NEW. Dispatched with Royal Mail 2nd Class. Please check my other items - bundles welcome. ZARA WOMENS STRIPE TOP SIZE XL. Condition is Used. BLUE AND WHITE TOP. IN GOOD USED CONDITION. Fits a uk 10 best. ZARA NAVY BLUE/WHITE STRIPE TIE TOP SIZE M (12/14). Condition is Used, IN VERY GOOD CONDITION - AS NEW Dispatched with Royal Mail 2ND Class. Zara Red White Striped Floral Top Size S. Condition is Used. excellent condition from a smoke free home. Dispatched with Royal Mail 1st Class. Zara Striped Wrap Blouse Size 10. Condition is Used. Dispatched with Royal Mail 1st Class. 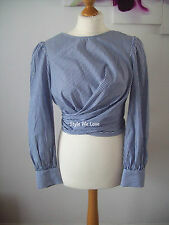 Ladies blouse top from Zara Woman in a blue & white stripe that ties at the front and fastens up the back with buttons. 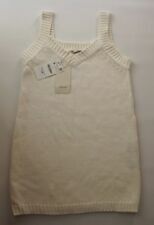 Size L. Measures 20.5” from underarm to underarm and 21” long from the back of the neck. In excellent condition. From a smoke free home. LADIES ZARA COLLECTION, BLACK & WHITE STRIPED EFFECT TEXTURED LOOSE. ZARA BLUE/WHITE STRIPE COTTON BOHO STYLE TOP. IN VERY GOOD CONDITION. 3/4 SLEEVE. Zara Blue And White Stripe Blouse. Condition is Used. Dispatched with Royal Mail 2nd class signed for. 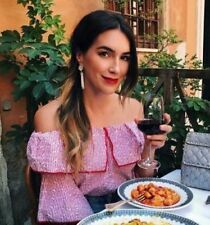 Lovely blouse from Zara three quarter length sleeves that tie looks great with jeans, in excellent condition comes from a smoke and pet free home. Please see my page for similar items. Zara Striped Top. Condition is Used barely worn.Dispatched with Royal Mail 2nd class. It’s cropped with a slight peplum and is a polycotton fabric with elastine for a slight stretch and a good fit. Having a Spring clean! Reduce, Reuse, Recycle 😀. Cotton striped top with twisted sleeves, very deco! and that colors 😍. ZARA Red And White Stripe Tie Detail Shirt BN Size S. Dispatched with Royal Mail 1st Class. ZARA Ladies Blue/white striped cotton long-sleeved shirt size S BNWOT. But in Spain and never worn. This item comes from a smoke free and pet free home. Please have a look at the other items I have listed. Zara Woman Blue and White Striped Blouse / Shirt. Long flared sleeves. Underarm to underarm: 50 cm approx. Sleeve length: 59cm approx. Length: 62cm approx. 100% Cotton. Zara/Trafaluc Striped Blouse with Embroidery Detail. Striped blouse, flared peplum at waist, slits and ties detail at cuff. Lion/flower embroidery at back. Condition is New with tags. Dispatched with Royal Mail 2nd Class. 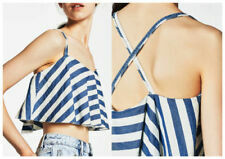 Zara Blue and White Stripe Halterneck Top. Condition is Used. Dispatched with Royal Mail 1st Class. Zara Striped Shirt with painted and beaded floral pattern in pink, white and yellow on back. Slightly boxy 80s shape. Condition is Used, worn a handful of times. From a pet and smoke free home. Dispatched with Royal Mail 1st Class within 2 working days of receipt of payment. ZARA Woman Blouseis listed for sale. Zara Ladieswear. Zara Trafaluc collection. Blue and white stripped blouse/ top. White frill at the base of the blouse for styling. back black ribbon for styling. 99 o ve rs iz ed f it. Zara Navy & White Striped Shirt Size Medium Condition is Used, but still in good condition. Please see pictures and ask questions. Comes from a smoke and pet free home. Dispatched with Royal Mail 2nd Class. Zara Basic Black And Grey Stripe Cotton Top Wth Coordinating Hem Size Small. Condition is Used. Dispatched with Royal Mail 1st Class. ZARA WOMAN. SIZE: EUR L / USA L - UK FITS A SIZE 12 /14. A STUNNING SHIRT THAT CAN BE WORN LOOSE / WITH A BELT / OR AS AN OVER-SHIRT. FRONT FASTENING WITH SEVEN SMALL PEARLISED BUTTONS. Ladies Zara Striped Blouse Size M EXCELLENT CONDITION. Condition is Used. Dispatched with Royal Mail 2nd Class. Excellent clean condition really looks stunning on side zip .Ladies Zara XS Blue /white Stripe Cami Style Sun Top Blouse Festival,holiday. Condition is Used. Dispatched with Royal Mail 2nd Class. Zara Striped Peplum Top. Size S, would fit a 8-10. Condition is New with tags. Dispatched with Royal Mail. Zara Striped Blouse Size M. Button fastening to back. Silky material. Worn only once. Excellent condition.